It’s officially oyster season and if you’ve been eating out a lot, you’ve probably noticed a few places with Oysters Rockefeller on the menu. For some restaurants, the dish is a seasonal tradition, while at others it’s a retro classic worth revisiting every few years. Sadly, I’ve had several versions that were nothing more than subpar bivalves slathered in creamed spinach and a horrid crust of industrial breadcrumbs. So what’s up with the Rockefeller, you ask? In 1899, Jules Alciatore was in need of a dish that could replace the hard-to-get Burgundian snails on the menu of his father’s New Orleans’s restaurant, Antoine’s. Oysters weren’t just local, they were plentiful, and Alciatore knew he had a hit on his hands when the oyster’s sauce was noted for being “rich as Rockefeller.” Oysters Rockefeller became a smash success for the Creole-cuisine restaurant, still in operation today and considered the oldest family-owned restaurant in the country. Imitations of the dish quickly showed up on menus around town. But they were just that—imitations. Alciatore refused to ever divulge the secret recipe and ultimately took it with him to his grave. While Antoine’s continues to serve Oysters Rockefeller, chefs keep mum on the actual ingredients, with a few admitting that spinach—often considered the main ingredient—isn’t actually involved at all. In 1948, Roy Alciatore revealed ten of Antoine’s signature recipes. Among them was a “diversion recipe,” for Oysters Rockefeller that included butter, spinach, onion, Tabasco, and Herbsaint, a New Orleans-produced anisette. The diversion recipe took on a life of its own (going viral, before viral was viral) and is now what most of us expect when we order the dish. In 1986, an independent laboratory test was performed on a takeout oyster from Antoine’s, and the results isolated a few key ingredients: parsley, celery, scallions, capers, and olive oil—nothing like the dish we’ve all grown to expect. For the original, you’ll have to make the trek to Antoine’s, but for a damn good facsimile of the viral version, I offer you this recipe—adapted from New York supper club, The Darby. My culinary partner in crime split a dozen with me on Sunday, and we took a few photos along the way. Place a strainer over a medium bowl and gently shuck the oysters into the bowl, catching the meat and straining the liquor. Reserve the deeper halves of the oyster shells. Scrub each shell clean. Dry and arrange on a sheet tray. Set aside. In a large sauté pan, melt the butter over medium heat. Add the shallots and cook for a few minutes. Add the flour. Stir together as the two begin to toast and turn a golden brown color. Do not overcook. Add the Herbsaint and cook until most of the liquid has evaporated. Stir in the garlic and anchovies. Season lightly with salt. Add heavy cream and oyster juices and cook for an additional minute. Fold in spinach, watercress, basil, and tarragon—a little at a time, if necessary. If the mixture seems too thick, add more cream or water, a little bit at a time. Place the reserved oyster shells in the oven and bake until warm, about 2 minutes. In a medium bowl, mix together cheese, panko and breadcrumbs. Set aside. 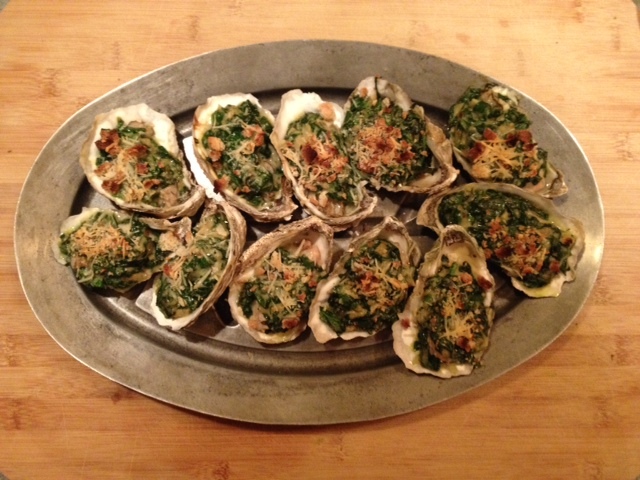 Spoon scant tablespoons of spinach mixture into each oyster shell and top with an oyster. Top with a little more spinach mixture and then sprinkle on the breadcrumb and cheese combo. Transfer to oven and bake for 2 to 3 minutes, until oysters are warm. Remove from oven. Turn up heat to broil and finish oysters under the broiler until breadcrumbs are toasty and golden. Top with scallions and serve.